Peter has changed his mind – again – about what to be for Halloween. Then, Zorro, then Count Dooku. His Count Dooku was pretty good. Last night, he decided to be a police officer. Fritz has been hard at work trying to accommodate him, but I keep telling him to hold off. Once Peter gets dressed up, he’s happy for a few hours. Then he changes his mind. Let’s not get him dressed until it’s time, right? The only thing about which he has been consistent is what to be for the All Saint’s Day Party tomorrow. Naturally, no costume is necessary. He’s fine, just the way he is. It doesn’t matter who is in power, I have a deep-rooted distrust of the government. It’s a good thing. This doesn’t mean that I don’t think it’s good for anything. I mean, my husband works for the federal government. Governments, big and small, have some usefulness. But we need to keep an eye on them. Whose best interest do they really protect? Ultimately, their own. And the bigger they are, the worse the self-protectionism gets. So we just need to watch them. So, let’s look at the H1N1 virus and the vaccine that is in short supply. This article, and others, have been highlighting how there isn’t enough vaccine available to meet demand and that those who are not in a high-risk group are getting it. Selfish people, huh? Fair enough. I have no argument with that list. If you fall in one of those categories, go get the vaccine, if you can get it. However, it is very interesting to note that according to that site, those groups make up approximately 159 million people. I checked this database with 2000 census figures, and people 24 years and younger are about 81 million. So 78 million people are in one of the other categories. Seems a bit high, but I won’t even argue that. Fine 159 million people should get the H1N1 vaccine. OK. So, we ordered a little extra. 91 million extra. In the U.S., they say that those under 10 should have 2 doses. That’s 39 million people (assuming every single person in that age group got the vaccine). We’re down to 52 million extra doses. Over 30% extra. #1 And we want the government running a health care system? They won’t waste money? #2 It is not in the government’s best interest to lose money on this deal. It is in the government’s best interest to have every single H1N1 dose used up. And paid for (mainly with private insurance). So, who do they expect will use up those 52 million surplus vaccines? Are they hoarding them with the intent to resell them at a higher price to another country? Do they intend to frighten the daylights out of everybody in order to create panic and high demand for the vaccine? If anybody can enlighten me as to why we would order so many extra doses, please do so. For now, I think we just need to pay close attention to what happens if the rest of the order comes in and demand drops. painting the hats we made for Zorro and Zorrito (Petey thought Fritz’s Zorro costume was cool and wanted to be that, too. Update: he’s changed his mind again, but the new one is no effort on my part!). repairing the white robes I made for Princess Leia two years ago so that they can be reused as angels robes (we shall have a whole choir of them). convincing all three boys that ordinary belts will work just fine for their costumes. hemming the Zorro masks so that the boys don’t get frayed edges in their eyes while walking around tomorrow night. making a Zorro cloak for Fritz. checking angels wings and halos (made by the girls) to see if they need anything else. checking temperatures and administering motrin if necessary to sick children, and hoping they are fever free by the end of the day, or no fun tomorrow. Everybody seems to be getting better today. grocery store: we missed our usual Wednesday night shopping due to illness, and if I’m home instead of out on Saturday night, I will need candy to give out. figuring out how to get my husband’s New Jersey absentee ballot to count. It arrived here early this week, but there was no way to get it to him (and back again) before the deadline. Surely there is some way for his vote to count. It’s expected to be a tight election. It’s Friday. Another week over. Soon, another month over. Every day that passes lifts my spirits. She said she wanted grapes. I got out grapes. She said she wanted strawberries. I sliced off green tops. She said she wanted a banana. We peeled a banana. …and she ate half the banana. They say you need five servings of fruits and vegetables a day. One down, four to go. Me: I’m going out to lunch today, all by myself. I don’t know where I’m going, but it will be a sit down restaurant with real flatware. Bill: (laughing) I hope somebody hits on you. Me: I have gray hair, honey. Nobody is going to hit on me. And so I went. I ended up at a Macaroni Grill where I have only eaten one other time – right before Bill left. The host put me in the exact same booth where we sat before. I sat on the same side and ignored the empty seat across from me. It was nice. Nobody had to go to the bathroom. Nobody climbed under the table. Nobody spilled anything. Nobody talked too loudly. Nobody needed me to cut up their food. Nobody had to be convinced his meal was going to be yummy, even if it wasn’t like Mom’s. Nobody drew stares. Nobody hit on me. The waiter, a young odd man I dubbed “Mr. Thumbs Up,” did keep calling me “hon” but in a manner completely devoid of innuendo. I finished the book I was reading. I sat with a napkin on my lap and gently dabbed my mouth with it when necessary. I ate dessert. I paid the bill, shocked by how cheap it was since it was lunch for one and not dinner for eight. I left a generous $3 tip. I went Christmas shopping (nearly done now). No whining. No crying. No slow-moving children. No buckling. No distracting. No pleading. No bargaining. No bribing. I went home. Happy. Renewed. This is my second to last review of the bonanza. I think. Last school year, at some point, I saw a blurb on Love2Learn Blog that Hillside Education was seeking students’ renditions of The Creation of Adam to be used as the cover art for a new book. It just so happens that my homeschool curriculum (Mother of Divine Grace) encourages the occasional copying of works of art, and it just so happened that the art work Billy was studying included this piece by Michelangelo. Naturally, I had him copy it, and I sent it in. His copy was not selected for the cover. But that’s okay. 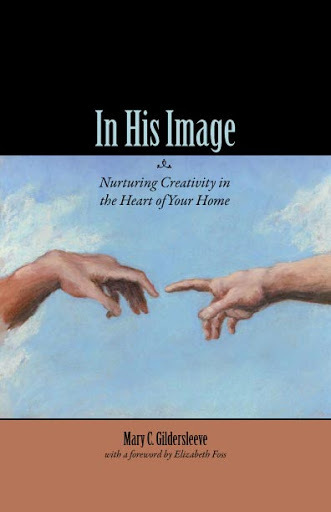 As a thank you for participating, Margot Davidson (who IS Hillside Education), sent Billy a copy of In His Image: Nurturing Creativity in the Heart of Your Home by Mary C. Gildersleeve. This is a gem of a book. The first part of the book explains what she means by creativity, and why she feels it is important to foster it in your home. The second part has some suggestions for various crafts (no photos or exact instructions as she wants students to fill in the gaps with their own imagination). Each chapter includes a different category of craft (for example: needlecrafts), and she thoughtfully lists the Dewey Decimal numbers you would need to find appropriate books at the library in those related categories. And in the appendices, she includes an annotated bibliography and a list of online resources for shopping. Perhaps the best part, aside from the library numbers, are the blank spaces she includes for you to fill in with your notes or other resources. The book is meant to be written in and referenced often. I found the online resource section particularly helpful as I was trying to plan my Christmas shopping. Aside from a heavy bias in favor of knitting (an admirable craft, but I prefer sewing), this book is excellent. I recommend it to those who want to encourage creativity in themselves and their children but do not know where to start. It is also a good resource for someone, like me, who enjoys one particular craft but wishes to support her child’s interests in different crafts and needs some help on how to do that. If you do happen to get the book, all the artwork submitted for the cover contest is inside, including Billy’s. As I mentioned, Billy received this book for free, and I was under no obligation to review it. I have received no other compensation for this review. The book is enough. Thank you, Margot. I get this question a lot. Usually accompanied by a sympathetic stare. I am surrounded by good women, many of them military wives as well. They know. I don’t know why they bother to ask. I’m reading a book right now (review to follow) written by an Army wife as she suffers through a deployment. It is brutally honest. Too honest. I keep wanting to tell her to shut up. We don’t talk about these things. This morning I had a very short email from my husband. He’s written similar emails in the past. I want you to know that I’m safe and what you read in the news doesn’t involve me but it does involve those I know. The other times he has written something like that, I picked through the major news networks. Nothing. Not a single thing. Can you imagine your husband, son, best friend going off to war and dying and nobody hears about it? The news networks are too busy gossiping about a singer who collapses on stage or discussing which teams are going to the World Series. Important stuff that. As your world crumbles around you, nobody really cares. Today, I did manage to find the news event to which he was referring. Helicopter crashes. My husband has been traveling and had told me he would be flying yesterday. I am grateful that he had access to a computer and could fire off that email. I would be in a panic right now. Even with his email, I am in a panic right now. That email was 4 hours old. There were two crashes – was he in the second one? Utter nonsense, of course, but this is how an Army wife’s brain operates. There is a term: anticipatory grief. Your loved one is alive, but you have all the symptoms associated with grieving his or her death. It’s quite common in spouses of deployed soldiers, especially when tragedy strikes close to the soldier. It’s emotionally difficult to live with that grief for a long period of time. And there is no closure, because there is no actual death. You just keep spinning in the misery until it concludes – one way or another. It’s time for me to shut up now. We aren’t supposed to talk about such things. And how am I doing? I’m fine. We’re all fine. Only two more months. He’ll be home soon.